The Harvey Elite offers updated styling along with the superior comfort and auscultation capabilities that cardiologists have come to rely on. It is equipped with dual-bore, latex-free tubing that creates two uninterrupted sound channels and works with the optimally weighted, rugged, and stainless steel chestpieces. In addition, the Elite's diaphragm is designed to accentuate important sounds - all this enables you to hear cardiac, pulmonary and vascular sounds. This item is usually in stock and ships within 24 hours (Monday-Friday). This item may be returned or exchanged within 30 days of receipt of the order as long as the item is in new and unused condition. All original package contents must be included. Personalized (engraved) items may not be returned. Please phone or e-mail for a Return Authorization before returning any merchandise. We do not charge a restocking fee as long as returned items are in new and unused condition. Shipping charges are non-refundable. This is my second one! I bought this as a medical student in 2002 and it just broke (only the rubber though). 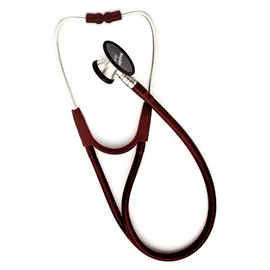 It is the best stethoscope I've ever used for general daily exams and anyone who borrows it (including cardiologists) love it too! Light, simple, great sound. I expect my replacement to be just as good since they tell me the stethoscope has not changed.